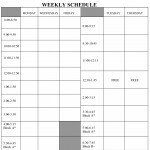 This blank schedule can be used for students that are trying to plan their semester schedule or break out their academic and work schedules in a visible format. 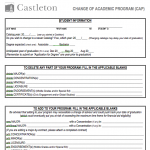 To make a change to your academic program (add or delete a major, minor, certificate, etc.) 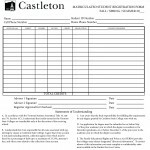 submit this form to the Registrar's Office. 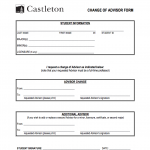 If you would like to change your advisor, complete this form and submit it to the Register Office. 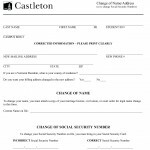 If you need to change your name or your social security number, this form can be completed and submitted to Financial & Registration Services. A year before your intended graduation date, this form must be filled out and submitted to Financial & Registration Services. This form must be filled out when a student is interested in registering for a tutorial (enrolling in a existing course on an individual basis), a practicum (field experience), or an independent study (student works individually with a faculty member on a subject/project). 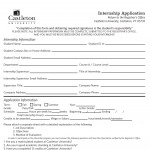 This application needs to be filled out and submitted when embarking on an internship. 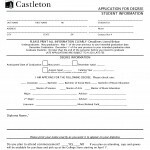 Degree-seeking students will use this form to register for classes. 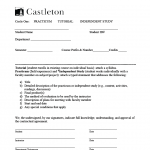 Students that are auditing courses or not degree-seeking will use this form to register for courses. 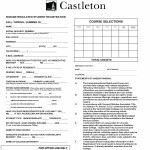 If you are looking to take a course elsewhere towards your Castleton degree, you need to fill out this form before enrolling in the course. Only courses completed at approved and regionally accredited institutions will be accepted for transfer. 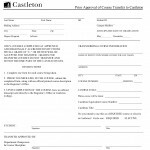 Grades for transfer courses do not transfer and do not become part of the Castleton GPA. Further instructions can be found on the form.